Modern Woodmen Park is a minor league baseball venue located in Davenport, Iowa, United States. It is home to the Quad Cities River Bandits, a single-A affiliate of the Houston Astros. It is located on the banks of the Mississippi River, in the shadow of the Centennial Bridge. Home run balls to right field often land in the river. Modern Woodmen Park was built in 1931, and was originally known as Municipal Stadium. 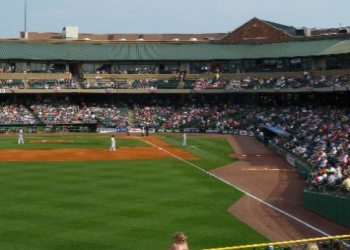 Herschel Greer Stadium is a minor league baseball park located in Nashville, Tennessee, on the grounds of Fort Negley, an American Civil War fortification, approximately two miles south of downtown. Opened in 1978, the stadium was posthumously named for Herschel Lynn Greer, a prominent Nashville businessman and the first president of the Nashville Vols minor league baseball team. It is home to the Triple-A Nashville Sounds of the Pacific Coast League and can seat 10,300 people. 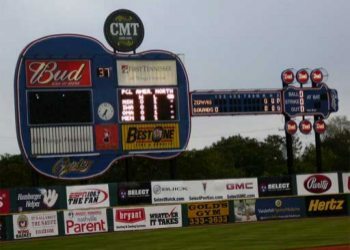 The stadium is best recognized by its distinctive guitar-shaped scoreboard, which displays the line score across the neck. Coca-Cola Field is a 18,050-seat baseball park in Buffalo, New York that hosted its first regular season baseball game on April 14, 1988, as the tenants of the facility, the Buffalo Bisons. Oriole Park at Camden Yards is often considered the trendsetter among American cities towards retro-styled, baseball-only stadiums located in downtown cores. However, the architectural firm that designed Camden Yards, Populous, originally implemented its design with Coca-Cola Field, which opened four years prior. 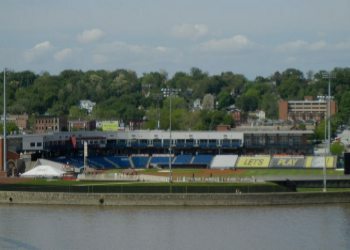 FirstEnergy Stadium is a 9,000-seat baseball-only stadium in Reading, Pennsylvania that hosted its first regular season baseball game in 1951. The park is home to the Reading Fightin Phils of the Eastern League. It is the first American baseball stadium to reach a total attendance of ten million without ever serving a team higher than AA. McCormick Field is a baseball stadium in Asheville, North Carolina. It is the home field of the Asheville Tourists minor league baseball team. As befits the hilly city of Asheville, the ballpark sits on a section of level ground partway up one of the city's hills, providing a picturesque atmosphere. The park features an amusing scoreboard which reads "Visitors" in the guest slot and "Tourists" in the home slot. The ballpark was built in 1924 and was named after Asheville resident Dr. Lewis McCormick; it is one of the oldest minor-league stadiums still in regular use.